I never bothered to play Jamestown for months after its release because, frankly, I was kind of burned out on shmups. There have been a lot of them lately, and the screenshots for this one did little to impress me. So, what makes Jamestown different and worth playing? Several important things, actually. It has a beautiful, consistent art style that looks like a modern day take on Final Fantasy VI, right down to the steampunk trappings. The story is completely bananas—historical fiction retelling the story of early American colonization, only on Mars, with all the same characters (John Smith, etc.). It comes across entirely through descriptive text and pixel art paintings, which work together to make a surprisingly gripping whole. Then again, I have a soft spot for bananas historical fiction. Up to four players can play at once on one computer, using whatever combination of peripherals are available—mice, keyboards, Xbox 360 controllers, etc. There are only three buttons to learn and not TOO many enemies to dodge, at least compared to Trouble Witches NEO, making it pretty accessible by shmup standards. Maybe it's bullet purgatory rather than bullet hell. 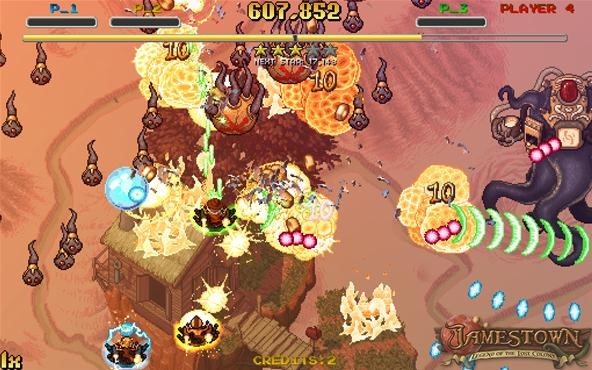 Worms Armageddon is the only other game I can think of that offers this much fun for four people to play together locally on one computer. An absolute must for anyone with a big enough monitor for four to crowd around comfortably. Hoard has been out on Steam for several months, just like Jamestown. Unlike Jamestown, I didn't pass over this game because of prejudice, but inadequecy. My PC gaming has been limited by the well-meant, but limp technical specifications of the ASUS netbook that was my main PC for more than six months. But no more. Hoard was the first game that entered the virgin SSD on my new massive gaming tower... and it's pretty good. Like Jamestown, this is a game best played in groups of four, and in this case, preferably online. Each level is a map of a small medieval fantasy area full of towns, farms, wizards and the like. Each player controls a dragon who must plunder more gold from the surrounding towns than their opponents before time expires. However, the longer a given human edifice is left unplundered, the wealthier it will be when you finally do seize it. This leads to an interesting balancing act not quite like anything else in games, but also not that deep. The single-player campaign, while endowed with ample maps, grows repetitive and tiresome rather quickly (although some just released DLCs may help with that). Multiplayer is where this game really shines, offering a novel, if somewhat limited experience for frag-happy foursomes. Summer of Arcade 2011 has produced a record crop of amazing downloadable Xbox 360 games to fill this usually slow game season. Released earlier this week, the final game in the set is Toy Soldiers: Cold War. 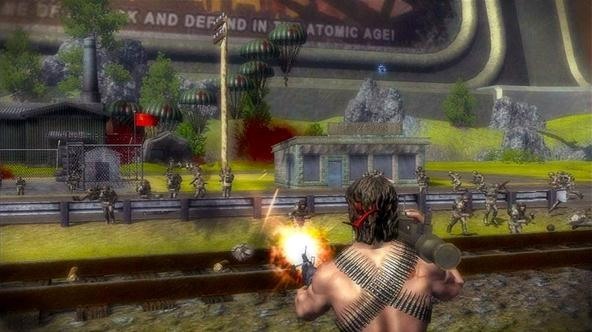 The follow-up to 2009's immensely popular Toy Soldiers is still a lighthearted tower defense game with an emphasis on directly controlling towers and vehicles after they are built, rather than passively allowing them to shoot on their own. There aren't very many places to place towers in each map, which means that tearing down and replacing towers with appropriate ones for each wave of enemies is necessary. Controlling the towers is fun, but playing as an immobile turret in games is frustrating, and I tired of it quickly. 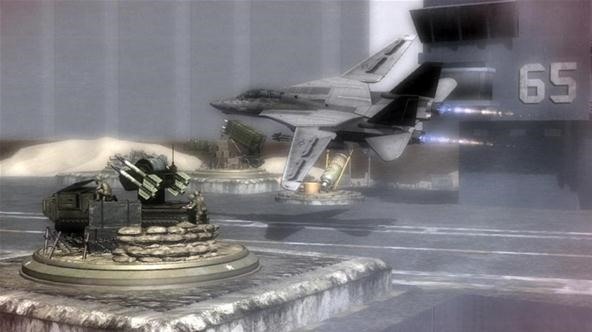 Where the game really shines is the segments that let players control something that moves, like an attack helicopter or Rambo. These parts are fantastic, and the tower defense is good enough that this game is sure to join the embarrassingly large library of completed tower defense games on my many hard drives. It is indeed a 360 exclusive. 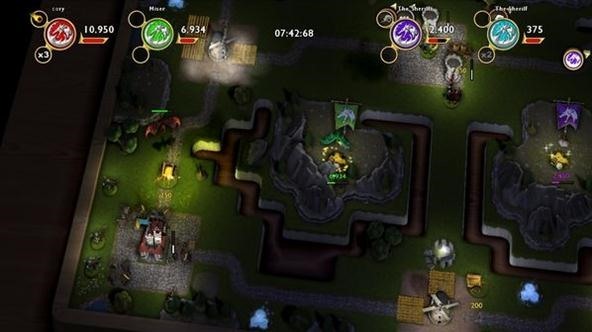 It's fun, but there are plenty of great tower defense alternative on PC. Are you familiar with Defense Grid: The Awakening? No, but I looked it up and that one looks pretty cool too. From what I understand, though, you don't control the towers.